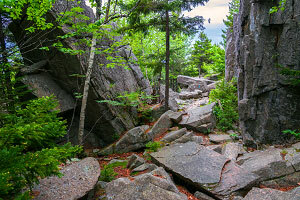 With its close proximity to the popular Ocean Path trail, Gorham Mountain is a popular peak for hikers even though it isn't the tallest or most noticeable mountain in the park. The trail up to Gorham Mountain has relatively modest elevation gain and is a fairly easy family-friendly hike. Despite the ease of the hike, tourists are still treated to wonderful views from the summit with Sand Beach to the east, the Beehive to the north, and Otter Point to the south. The mountain is covered in blueberry bushes, so when they are in season, this is an added bonus! Access: Gorham Mountain Parking Lot (the parking lot after Thunder Hole). Elevation Change: 500-ft gradual ascent to top of Gorham Mountain. The trail makes a gentle ascent up the mountain, including a few sets of beautifully laid out steps. Once above the initial band of cliffs, the view opens up and you can get a great view of the surrounding areas, especially Otter Point to the south. 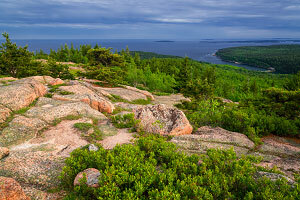 Continue north along the pink granite ridgeline and in no time you will reach the marker at the top of the peak. Enjoy the panoramic views of Sand Beach and Great Head to the east, Otter Point to the South, the Beehive to the north, and the large ridgeline of Cadillac Mountain in the distance to the west. Return the way you came. On your return hike, consider taking the Cadillac Cliffs Trail for some alternative views. This short spur trail is a bit steeper and has a few minor scrambling sections as it takes you along the ocean side of the cliffs. Exploring along the base of the cliffs is a wonderful experience that includes hiking past an old cave (that used to be on the edge of the ocean) and hiking through a really small tunnel in the granite. The spur rejoins the main Gorham Mountain Trail at the Waldron Bates memorial plaque. 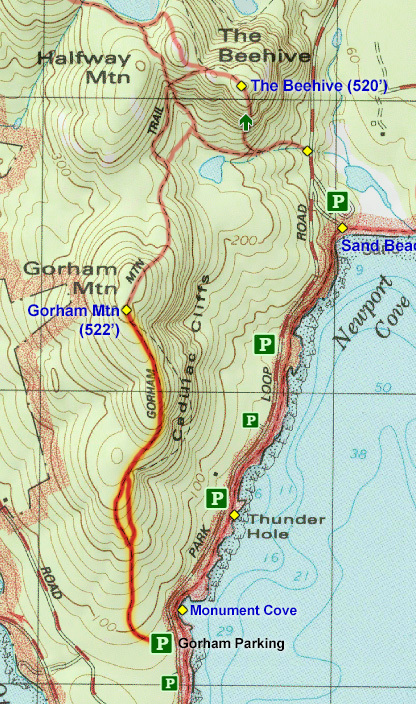 Note: For those looking for a longer option, you could hike the Gorham Mountain Trail all the way to the Bowl Trail under the Beehive and then return via Ocean Path to make a big loop hike. This is a great little hike that the whole family can enjoy, especially if the blueberries are in season. Despite Gorham Mountain not being the tallest peak in the park, you still get exceptional views.